After being linked to Rana Daggubati on and off, Kollywood beauty Trisha Krishnan broke millions of hearts when she decided to get married to businessman Varun Manian. On January 23, Trisha got engaged to Varun in a private ceremony, and people thought that Trisha has at last found her soul mate. But things started to get sour post Valentine’s day and after three months of being engaged the couple decided to break off their engagement and call off their marriage. 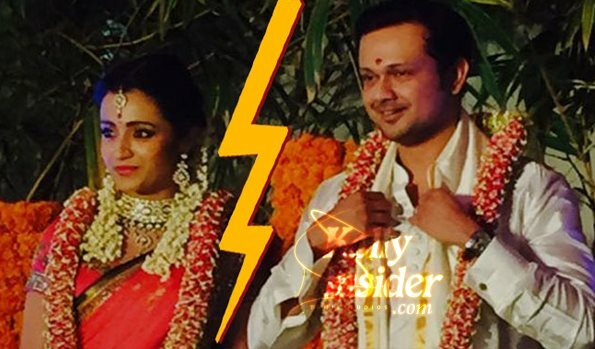 Though Trisha doesn’t seem upset with the marriage being called off, the gossip mongers are busy speculating the reason behind their split up. The newly engaged couple were often spotted maintaining distance at parties and public events, making it evident that things have hit a rough patch. Trisha got engaged to Varun in a private ceremony on January 23, 2015. The event was grand affair attended by close friends and family. The reason for the couple’s split is unknown but we hear that their relationship started dwindling after Valentine’s Day. The couple stayed tight-lipped about all their differences until Varun posted a tweet. His message on the microblogging site dated April 8 read, “Pre-wedding jitters? No better friend than a sister?”; raising eyebrows! According to a leading entertainment website, the duo planned to break their engagement after Varun went to US with his parents for a vacation. Earlier it was reported that, what sparked off the speculation is the fact that Trisha failed to turn up for Varun Manian’s family function held recently. Sources say that the lady may eventually open up on this issue and until then it would be best to refrain from speculating about their relationship. While people would think the pair might be going through a tough time digesting the sudden breakup, Trisha is believed to be having quality time with her friends. The south Indian star has perhaps moved on in life without any regrets. The Saamy actress is also busy on her career front with few films lined up. She has signed a projects with Kamal Haasan, Telugu superstar Balakrishna and Tamil actor Jayam Ravi.